ScreenChomp iPad app records your screen actions and voiceover narration as a screencast. Use screencast iPad tutorials to demonstrate concepts to students in class, or provide course content outside the classroom in a flipped learning environment. Creating screencasts with ScreenChomp iPad app couldn’t be easier. Start the ScreenChomp app by tapping its icon; then tap the large Draw and Record arrow in the top right of the opening menu screen to start a ScreenChomp. 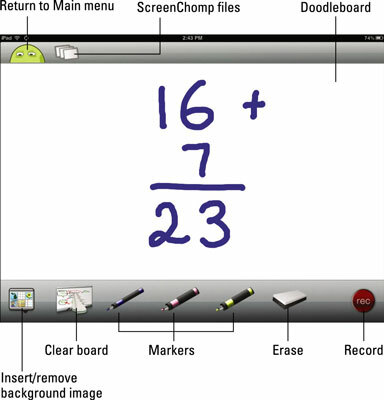 You’ll be presented with a screen that looks very much like a whiteboard or, as the app publisher calls it, a doodleboard. School is often broken down into nice, neatly packaged academic courses. In reality, however, learning always tends to span varieties of skills and traditional academic disciplines. You may be teaching mathematics, but any screencast or presentation is an opportunity to stress the importance of skills such as preparation, organization, rehearsal, and enunciation. Learning should never be one-dimensional. You can start recording your ScreenChomp with the default empty board, or you can prepare it ahead of your recording. Have you ever been to a stage play? The players could conceivably start with an empty stage, turn down the lights, and then bring out all the props while you sit there in your seat, but it would destroy the magic of the opening scene. There are also times when good teaching parallels theatrics, especially when you want to capture someone’s attention and draw him into your presentation. 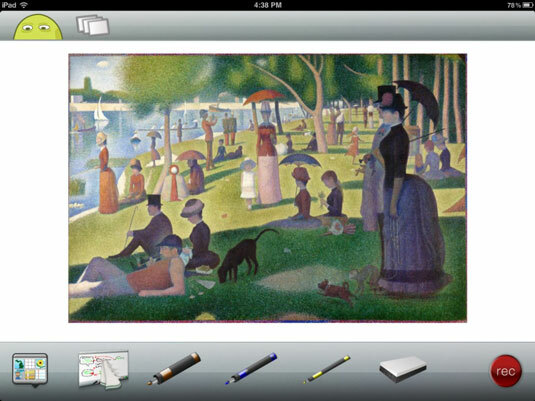 If you want to create a tutorial on Impressionist art, for example, you could load images while recording, or you could preload a background image so that it’s ready onscreen when you tap the button to start recording. Background image: Background images sit behind anything you draw onscreen. 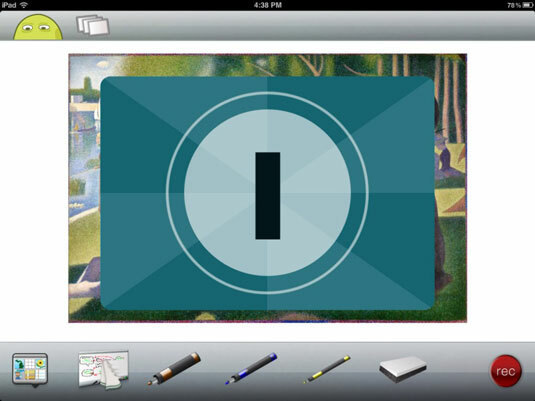 You can select your image from the library on your iPad or from a Dropbox account if you have one, or tap the button to take a photo with the iPad camera and have that inserted as your background. To clear your background image, tap the Background icon on the left of the bottom toolbar and select Remove Background. Clear board: Tap and hold this icon to erase everything on your board. Markers: There are three markers. Use the markers to draw on the board, whether you’re writing numbers and working on a math problem, writing some text, highlighting a part of an image, or doodling a picture of your own. Tap and hold any of the marker icons to change their color and thickness. Eraser: Tap the eraser, and drag your finger over anything you’ve drawn on the board to erase it. Note that the eraser doesn’t erase any part of your background image. You need to use the Remove Background option on the Background Image tool to do that. ScreenChomp displays a short sequence of countdown numbers. Clear your throat and start recording when the count gets down to zero. You don’t have to record everything in one session. Use the Pause button to stop the recording at any point. Take time to collect your thoughts, change or erase anything onscreen, and then tap to resume recording when you’re ready. When you’re done, tap the Stop button. On the screen that appears, name your screencast and save it or tap the large Trash icon to throw the screencast away and start over. Upload your recording to the ScreenChomp website by tapping the ScreenChomp icon in the lower-right corner. You don’t need to create an account, and you’ll get a link to your video that you can share or paste anywhere. ScreenChomp also enables you to post directly to your Facebook account.